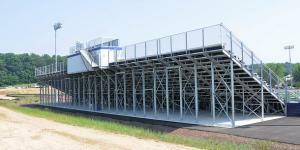 The leg truss stadium is a great solution between angle-frame bleachers and a permanent grandstand. Especially for a stadium in the 500- to 2,500-seat range, a leg truss system delivers unbeatable value. With its below-deck space, leg truss stadiums are a great solution for under-deck storage, buildings, etc. Stadium graphics can also be added to the support structure.